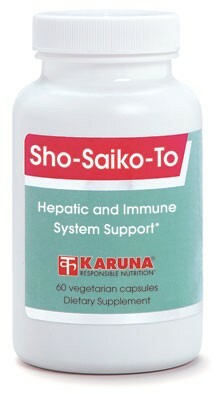 Sho-Saiko-To is the Japanese name for an ancient Chinese formula highly regarded for maintaining healthy liver and immune function. Clinical trials have repeatedly demonstrated the efficacy of this formula for protecting the liver. 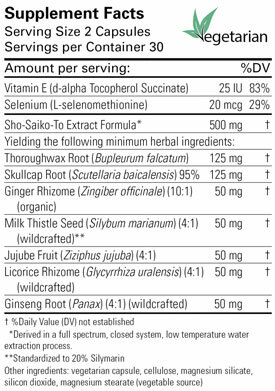 Adding synergistic benefits to Sho-Saiko-To are the well-known western herb Silybum marianum (milk thistle), selenium and vitamin E, all of which have shown hepatoprotective antioxidant activity. The reproduction of certain viruses has been shown in laboratory studies to be inhibited by the ingredients in Sho-Saiko-To. scrutiny (J Gastroenterol Hepatol 2000;15:D84-90). Sho-saiko-to promotes normal serum liver enzyme levels and increases antibodies associated with hepatoprotection (Gastroenterol Jpn 1989;24:715-9). In vitro studies indicate that Shosaiko- to and its constituents inhibit the replication of several viruses (Antiviral Res 1990;14:279-86; Planta Med 1992;58:171-3). Sho-saiko-to has been successfully used to reduce the risk of disturbances in normal hepatic chromosomal replication (Jpn J Cancer Chemother 1989;16:1519-24; Cancer 1995;76:743-9). Suggested use for adults: Two capsules daily, taken away from meals, or as directed.